1. Line a lightly greased 450g loaf tin with clingfilm, leaving plenty of excess hanging over the sides. Cut the cake horizontally into thirds. 2. Place the bottom slice of cake into the prepared tin – don’t worry if it doesn’t fill the whole tin, just push it snugly against one end. Using a dessert spoon, top with half the ice cream, dotting it randomly over the cake but not going over the edges of it. Repeat with half the nests and half the lemon curd. 3. Repeat this with the remaining ice cream and nests on top of a second layer of cake. Finish with the top layer of cake. Pull the clingfilm tightly around the cake, pressing down gently to compress the layers, and seal. 4. Place in the freezer for at least 2 hours, or until firm. Turn out onto a plate, unwrap and then cut into slices immediately with a sharp knife. 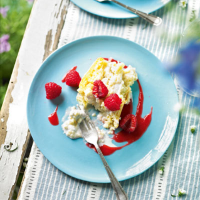 Delicious served with fresh raspberries and raspberry coulis.